Birds of a feather can now kill together in the all new avian-themed Giant Eagle Landing zone. Super Animal Royale fans can flock to this new area, and make use of the overhauled progression system that includes new super challenges, DNA magnets, and more! Since its Early Access soft launch in December, Super Animal Royale has been updated at a hummingbird pace, with playable Super Animal breeds growing from 50 to 140, cosmetic items quadrupling to 450+, all while maintaining a 97% Overwhelmingly Positive (pawsitive?) review score on Steam and nurturing a passionate community of players and streamers. Hot on the slippery heels of an April 1st in-game event that saw all bullets replaced with deadly bananas, Super Animal Royale is getting one of its biggest updates yet, alongside its debut on the Humble Store. To celebrate, the game will be available at a 15% discount and a weekend test session of squads (4-player) mode will be held from April 5th-8th. The very first Super Birds are also arriving on the island: 24 new feathery combatants bring the total Super Animal count up to 140. The Super Birds arrive alongside their very own avian-themed land, Giant Eagle Landing, with fine establishments like Beakeasy (a seedy nightclub), Eggsotic Cuisine, Flappy Jacks, and the Giant Eagle Rides attraction. It’s a wonderful time to visit Super Animal Royale’s island, especially since Spring has sprung and the new cherry blossom trees are in bloom! The Giant Feathery Update also adds the highly anticipated “Super DNA Magnet” item to the game, which enables players to focus all of their DNA earning on a specific animal for the next 3 matches to get them closer to the red panda, sloth or any other animal they have their eye on. And the new Super Challenges system, debuting today, provides a new way to earn items including the new Super DNA Magnets. Completing tasks such as slipping other players on banana peels, chopping tall grass to find items, or eating coconuts will earn players bigger and bigger rewards as the difficulty of challenges ramps up. Players unlock a new challenge every day, stacking up to a maximum of three. In addition to Super DNA Magnets, players will be able to earn Animal DNA and Super Serum, which are combined to create new Super Animals in the Research Lab. Super Animal Royale is a top-down multiplayer survival shooter for up to sixty-four endearingly deadly creatures. Engineered to charm and trained to kill, Super Animals are cute enough to make you go “Aww” and deadly enough to make you go “Ahhhh!” Select your favourite from a menu of foxes, pandas, kitty cats, and other bloodthirsty beasts. Parachute into the ruins of an ill-fated safari park and fight off a lethal barrage of bullets, explosives, and silly dancing. Enjoy carefully balanced run and gun gameplay combined with an intuitive fog of war system that restricts a player’s view to line of sight, allowing for sneaky, strategic play. Matches are a brisk six minutes, so you’ll never be out of the action for too long. Explore a beautiful 2D world, inspired by classic top-down adventure games. Cut tall grass and loot abandoned structures in search of the guns, bananas and health juice you’ll need to reach the top of the food chain. 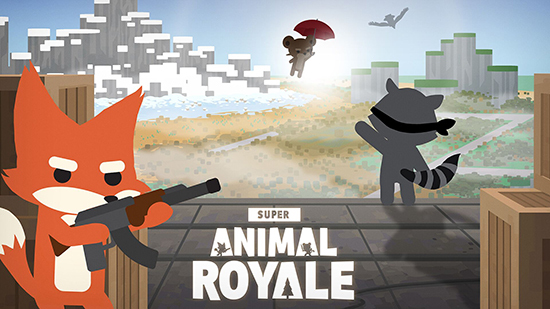 Super Animal Royale is now in Early Access on Steam after an extensive public Beta test, priced at a murderously competitive $12.99, however players can also play the entire game for free in the Super Free Edition. Free Edition players get access to all modes, and can unlock items and progress through the game, but in order to equip cosmetic items, unlock new Super Animal breeds, and invite their friends to Steam lobbies they’ll need to upgrade. If they do choose to update, all their progress and items sync seamlessly into the full version. A Founder’s Edition with a ton of cool cosmetic enhancements and the game’s original soundtrack is also available in a Steam bundle, priced $25.17. The game is currently on sale for 15% off on the Humble Store until April 10th.